Accuweigh are suppliers of CAS crane scales which can be used to correctly position heavy loads onto trucks, among other applications. Recently Accuweigh supplied sets of Castron 3 crane scales and Castron 2 crane scales, both with a weighing capacity of 5 tonne, to Score Pacific’s Welshpool plant in Western Australia where they were used to weigh items in order for the operator to position the heavier items in such a way to minimise the potential for axle overloading and unbalanced truck weights. The Caston 3 crane scales are a heavy duty model with a sturdy housing to withstand the knocks and bumps expected while loading the heavier items, such as gas turbines, stored in the yard. The Caston 2 crane scales are used inside the factory for weighing the lighter and smaller items, like valves, prior to loading. 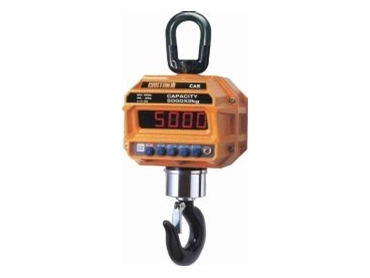 A bonus feature of the Caston 3 crane scales is the supplied wireless hand held remote control that displays the weight readings from the crane scales to the operator while also providing access to the function keys on the front of the crane scales. These crane scales are fitted with an internal rechargeable battery and are supplied with a spare battery pack and charger to ensure continued crane scale operations over extended periods. Accuweigh is Australia’s largest industrial weighing company and has eight branches across Australia providing sales and service support on crane scales, weighbridges and all industrial weighing equipment.